All pilots have their favorite airplanes; mine are the PA-18-150 Super Cub and the turbocharged Cessna TU206G. I prefer the Super Cub for the low and the slow, the contour flying and serious off-airport landings; I like the Cessna 206 for carrying loads, traveling distances, and flying on instruments. 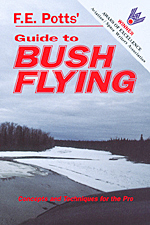 However, there is a small difference of opinion regarding the Cessna 206, one that has considerable validity on both sides: which model is best for the bush operator -- the turbo or the non-turbo? As with all questions of this nature, the answer is: it depends. As the numbers show, the basic differences are service ceiling, range, and TBO. Therefore, for the VFR-only operator who does not require high-altitude capability, the standard Cessna 206 is the best choice. Inexpensive, simple, and easy to fly for even low-time commercial pilots, it is a money-making machine par excellence for the air taxi operator. Tires (main gear). As with the Cessna 180/185, the 8:50x6 6-ply tires are best for the main gear. If a proposed landing area is too soft or rough for them, use a Cub or Cessna 180/185 instead; it is no place to take a Cessna 206. Tires (nose gear). Here, there's a choice of three tire sizes. The 6:00x6 tire is a factory option with the Cessna oversized nose-gear fork, and many operators find it to be adequate. However, since this fork will also accommodate the larger 7:00x6 tire, those who operate regularly out of villages or camps where strips are soft, rough, and poorly maintained often specify it instead. Flint Aero. The old boy on the block, these wingtip tanks have been around for years. Depending on the model Cessna 206 you have, they add either 27, or 29.8, usable gallons, and, in the process, an additional three feet to your wingspan. Also included, for the F and G models, is a STC for a 200 lb increase in gross weight. This system requires two electric transfer fuel pumps, each with its own on/off switch and fuel gauge, and the pilot must manually transfer fuel from the tip tanks to the main tanks when needed. The added wing span provides a slight increase in STOL capabilities, at the expense of making some hangars unusable for the airplane. Also, of course, after installing the tanks, the airplane's wing covers must be modified because of the increased span. Uvalde. Manufactured to Part 23 standards, these internal bladder tanks -- there are three for each wing, and they fit just outboard of the main tanks -- add 54 gallons to your fuel capacity. A passive system, there are no switches to flip or fuel management techniques to learn. Unfortunately, the Uvalde tanks do not come with a gross weight increase, so the weight of the additional fuel (324 lbs) must come directly out of your payload. Engine analyzers and fuel computers. For all serious, maximum-range operations, I recommend that an engine analyzer, such as the Insight GEM, and a fuel computer, such as the SDI/Hoskins or Shadin Miniflow, be used. Only in this way can you manage your fuel burn, and keep up to date on the progress of your flight, with the precision required. Deicing/anti-icing equipment. You do your best to stay out of icing conditions, but sometimes, no matter what the forecasts or PIREPS had to say, your best efforts fail and ice finds you anyway. Therefore, deicing/anti-icing equipment is high on the priority list, even though at this time the FAA will not certify the Cessna 206 for flight into known icing conditions. However, you do have a bit of help available for those times when the icing conditions are mild -- stratus with low tops; a layer of steam fog, etc. -- and your accidental exposure brief. Propeller. Most experts agree that if you had to make a choice between wing or prop deicing/anti-icing equipment, prop it would be, for with the prop clean, as Bob Buck observes in his fine book Weather Flying, "you can pull a lot of ice-covered airplane around the sky." Since a propeller anti-ice system is a factory option, serious instrument pilots always make a point of having one installed on their airplane. Windshield. Anti-icing for the windshield is useful when you fly from a deep bush location that is "severe clear" but very cold into a coastal area where an approach has to be made to minimums through a layer of steam fog. This steam fog will just frost the windshield but that is enough, and while the airplane's defroster (if placed on high 20 minutes or so prior to the approach) is usually adequate to keep at least a small area directly above the heat vent clear, sometimes it isn't. On such occasions, the alternatives are to land by looking through an opened side window, or to use a windshield anti-icing system. The latter is far more elegant, and since a detachable electrically-heated glass panel is a factory option, it should be given serious consideration if you need this type of equipment. Combined wing, tail, struts, prop, and windshield anti-icing. Kohlman Aviation offers the British TKS ice protection system for the Cessna 206, which uses a glycol-based fluid to prevent or remove ice buildup. This well-proven system, whose lineage can be traced back to the mid-1930s (currently it is being used on airplanes as diverse as the BAe 125 and Short Skyvan), is certified on several light airplanes for known-icing conditions in Europe. Unfortunately, the FAA, in its infinite wisdom, has decreed that additional backups, primarily a second electrical system, be required if you wish United States certification for your "small Cessnas, Mooneys, and Bonanzas." So, though it is a proven system that is highly effective and can be installed under a STC, it is not at the present time legal for known icing in this country. Nonetheless, since real-time icing reports are rare and hard to come by in the remote north, and icing by its very nature is difficult to forecast accurately, the protection that the TKS system offers can be of value to some bush operators. Dual vacuum systems. Factory options, they are a must for IFR. Cargo tiedowns. These tiedown blocks -- they bolt to the seat rails -- are an important Cessna option for aircraft used in cargo operations. I generally use 12 of them, and always secure my cargo well -- using a custom-made heavy-duty cargo-restraint system manufactured out of 2" nylon webbing by Cargo Systems Company of Dallas, Texas -- even though it adds a little extra time to the loading and unloading process. (1)Regarding the time it takes to install the Flint tanks, on July 10, 2002 I received an email from the current President of Flint Aero, Charles LaGreca, telling me that there are three shops on his home field that can install the Flint tanks in about 40 hours and are charging at this time between $2200 to $2450. Might be worth checking out, and certainly worth it if the workmanship is top notch in all its details. (2) Also in his email, Mr. LaGreca mentioned that my wait is now over -- in fact, has been over for a number of years -- because Flint finally got around to redesigning his tanks and they are no longer vented through the caps on the top of the wings, but through the bottom of the wing. This of course doesn't help those of us who bought the earlier versions, but it is a good thing for those who need new LR tanks.